Two chemists from the University of Cape Town (UCT), Kevin Naidoo and Jahansha Ashkani (seen right, © Mail & Guardian), have just published a key article in Scientific Reports, an online open-access journal from the publishers of Nature. Their findings have the potential to pave the way for an early diagnostic tool that could lead to individualised treatment based on the unique genetic expression of cancer cells. The researchers studied the glycosyltransferase (GT) gene expression – the enzymes that build complex carbohydrates – in tumours, extracting their data from a database in The Cancer Genome Atlas (TCGA). They probed the relationship between the levels of expression for 210 GT genes and six types of cancer by examining the data of 1,893 patients. The cancer types studied were: breast (BRCA); colon (COAD); glioblastoma (GBM); kidney (KIRC); lung (LUSC); and ovarian (OV). 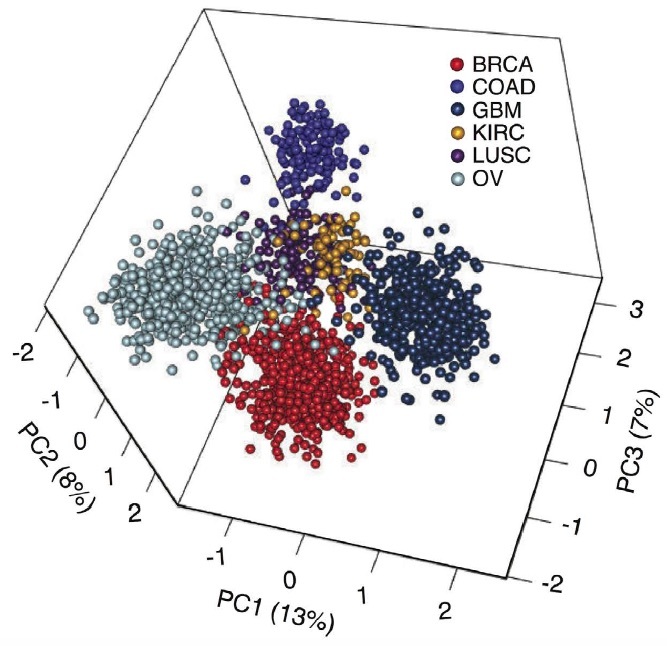 A principal component analysis was performed to separate the six cancer types based on the expression of GT genes and, as seen below (© Nature), the first three principal components (PC1 to PC3) successfully segregated the tumours. Naidoo acknowledged that this research, which was based on tumour samples from the USA now needs to focus on blood samples of patients gathered here in Cape Town. His collaborators include scientists in human genetics and pathology from the UCT medical school and the Centre for Proteomics and Genomics Research and they will have to gather a large number of patient samples for their diagnostic tool to have statistical validity. To develop a low-cost method for extracting the signature genes from blood, the team will have to extend genomic technology. Naidoo was upbeat, concluding: “We would like to see a partnership between computational data analytics laboratories like ours and clinical and laboratory researchers funded in large cohesive efforts.” As was said in an earlier blog, ex Africa semper aliquid novi, meaning “out of Africa there is always something new”! Simply stated, this new DBT-ABUS system would make it technically much easier for the radiologist to read films, and reduce possible diagnostic errors. It would detect more cancers at an earlier stage, particularly in women with dense breasts. With one visit there would be far less anxiety while waiting for results. Less Expensive than two consecutive visits. Go for it CapeRay! Your blog and Ian’s reply are very fascinating. I hope you are able to collaborate successfully in the future.